Barca's new captain Lionel Messi lifted his first piece of silverware since inheriting the armband from former midfielder Andres Iniesta. 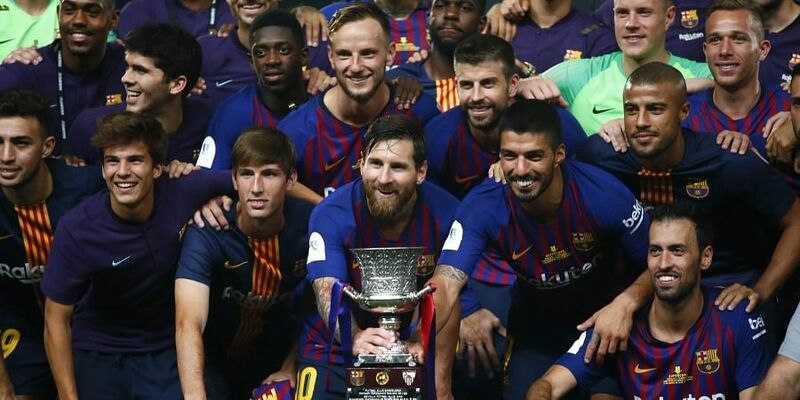 TANGIER: Barcelona lifted the Spanish Super Cup for a record extending 13th time by coming from behind to beat Sevilla 2-1 on Sunday thanks to a stunning strike from France winger Ousmane Dembele and a penalty save in stoppage time from Marc-Andre ter Stegen. King's Cup runners-up Sevilla took a surprise lead in the traditional curtain raiser to the season against Barcelona when Pablo Sarabia fired home in the ninth minute after Luis Muriel had powered his way through the Barca defence. Gerard Pique levelled for Barca shortly before halftime by pouncing on the rebound after Lionel Messi's free kick had ricocheted off the post, while Sevilla's Franco Vazquez glanced a header off the crossbar in the second half in Tangier, Morocco. "It was a really difficult game because we conceded very early and we had to fight back. A lot of players have only recently come back from breaks and that took its toll," Barca coach Ernesto Valverde told reporters. "We grew as the game went on. It was an exciting game and they also had their chances. It's good to win because it gives you belief in what you are doing and it allows you to start the season on the front foot." "My team deserve a lot of credit for showing that we have soul spirit and courage after Dembele's great goal and not only did we win a penalty but we also swarmed all over their goal," said Sevilla coach Pablo Machin. Barca's new captain Messi lifted his first piece of silverware since inheriting the armband from former midfielder Andres Iniesta, and the Argentine also overtook the Spaniard as Barca's most decorated player with 33 trophies to his name.